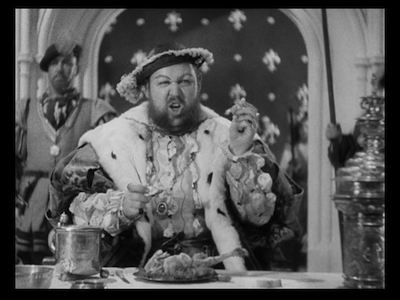 Charles Laughton as King Henry VIII–NOT a vegan. Full disclosure: As I type this, there’s a pound of Virginia farm bacon atop my refrigerator (fully cured, needs no refrigeration). There’s chicken in my freezer (it was dead first). Eggs sit uncracked in the fridge, next to the cheese and the turkey sausages made with sun-dried tomatoes. The other night I ate at a nearby restaurant, and though I filled up on lentil and kale soup and ordered a plate of broccoli as a side dish (in order to reduce my intake of french fries), I knocked off a big old beef hamburger topped with cheddar (locally sourced, as if that helps). If meat is bad karma, I’m in a lot of trouble. With all that in mind, I must admit I’m thinking about meat eating and veganism. I’m not thinking about it for the reasons many of my FB friends are advocating it. I think animals deserve a humane end, and I am reasonably upset when I get the e-mails about the Chinese practice of baking dogs alive. And it isn’t like the US has any bragging rights in this field–our factory farm practices are truly cruel. Moreover, legislators in many states are siding with our agricultural companies (including meatpackers), and making it a crime to document animal cruelty. Free speech proponents call these ‘ag-gag’ laws. That is a stupid way to keep the truth away from people. And the truth of meat is not pretty. Back in the days when I worked for the Empire, my Army unit spent a weekend in the woods learning survival skills from a local Special Forces detachment. We all watched several trapped animals meet awful ends. I have dined on batter-fried snake, and I had blood spattered on me from a twitching headless chicken one of the instructors threw into the audience to freak us out. The pictures I’ve seen of factory farm practices make me feel a bit guilty. I know where meat comes from and I am quite sure it doesn’t involve styrofoam and stretch wrap. * The USDA and FDA allow for adulteration of meat in ways that are banned in many other countries. Those cows have been eating feed grains, not the grass they evolved to consume, and that causes its own health problems. Sheep scrapie and Mad Cow were suspected to have been caused by feeding animals the waste from abattoirs, making cows and sheep unwitting cannibals. In humans, cannibalism is thought to be a major cause of Kuru, a fatal neurological disease. And the feed is not the worst of it–chickens fatten quicker if they’re fed hormones, so most chicken in the US has hormones in the flesh. Ditto all the antibiotics fed to feed animals, many of which are still in the meat after slaughter. Again, this could be avoided if consumers in the US demanded changes in the way we process meat. But the industry has its own lobbying arm that shoots down such changes. And most Americans would go into freakout mode if meat prices climbed after such regulations were put in place. * Meat consumption is problematic in a toxic world. An animal’s consumption of adulterated feed concentrates the problems in that feed. If there’s a small amount of dioxin in the plants your lunchmeat is eating, that dioxin (which is fat-soluble) will accumulate and be more concentrated by the time said lunchmeat gets to the Kaiser roll in front of you. This is certainly true of fish such as tuna, which are swimming in an increasingly toxic environment. Eating lower on the food chain doesn’t solve the problem completely but it does adjust the severity of the problem. * Need I mention Fukushima? in the wake of that ongoing disaster, there has been a remarkable lack of interest in making sure that food hasn’t been irradiated. And higher-than-normal background radiation readings have been reported all the way to Massachusetts. As Chernobyl taught us, the biggest threat from radiation is from the stuff you ingest. I note that it was only recently that Scottish sheep whose fields were dusted with fallout from the Chernobyl accident were allowed to be sold again (as safe for human consumption). It took 25 YEARS for background radiation from the accident to drop to acceptable levels. Again, animal flesh concentrates the poisons, putting them in the fat and muscle tissue. This is an issue we should all be looking at. *Larger point, from an activist/human rights advocate/lefty point of view. As Jeremy Rifkin pointed out in his book BEYOND BEEF, feed animals consume a third of all the grain of the world. There are carrying limits to the planet, and perhaps our practice of using food to create food (i.e., feeding several tons of grain to a single cow over its short lifetime) might not be the friendliest use of our agricultural abundance. By competing for arable land that could be growing food for humans instead of food for cows and pigs, we’re making human starvation problems worse. Beef cattle also contribute to the worlds’ methane problem (who knew? ), and methane is apparently a much larger greenhouse gas threat than we previously understood. If you’re a lefty, there are good human justice reasons for cutting back on meat. It’s a sharing thing. So that’s where I am–a reluctant carnivore but also not yet a vegan. The tastes and smells that meat dishes bring on remind me of family times when we’d gather for an event–call it nostalgia. I have three vegan cookbooks on my shelf, but cooking sans meat is a challenge. I suppose, given enough time, some of my more persistent friends and family members would break me and get me to a point where I could give up meat altogether. I think there are good reasons to go easier on meat as a part of my diet. I’m going to be a hard sell on the idea of ‘specieism’ (the thinking that humans are inherently superior to other life forms). I’ve seen chickens on the hoof, and I’m not that impressed. But I returned to the restaurant that so proudly served up my cheese burger a few days ago (did I say locally sourced?) and ordered a squash tart (tiny bits of goat cheese, but no other animals used). As I was contemplating posting all of this, I came across this TED talk about communicating with dolphins. Watching the video, it would be very hard to deny that the dolphins have a ‘personhood’ that we simply don’t tune into without study. So I’m off dolphin meat (not that I’ve ever seen dolphin meat for sale). But this also makes me angry about what we’ve done to the oceans. If we accept the idea that dolphins may be our intellectual peers, how do we justify destroying their habitat? ← Clowning at MoRUS this Friday night!!! !